Oh give me a zone…where the buffalo roam…where the beer and the nightlife don’t play… I like lazing on the beach as much as the next person, especially when there’s a waiter with crisp chilled pineapple near by, but sometimes one feels the need to get out and poke around a bit. Biking always brings me back to my carefree childhood, and it’s an easy way to burn some calories, so when the activities manage at the Anantara Phuket where I was staying suggested a biking tour around the area, it sounded simple enough. It sounded like some easy pedalling around the resort grounds. Little did I know what a surprise lay in store. Car? What car? Where were we going? I thought we were supposed to be biking? Curious, I obediently got into the hotel Mercedes but saw no bikes anywhere in sight. Were they in somehow hidden in the trunk of the sedan? The driver took us to a quiet country road not far from the resort, where a white hotel pickup trick was awaiting us, impressively equipped with bikes gleaming in the back. Ah … how utterly convenient! After Khun Aey gave me an Anantara baseball cap, strapped a safety helmet on my head, and offered to carry my little bag in his big backpack, we got on the bikes and pedaled through some of the picturesque back roads around Mai Khao, which is a protected national park area in the northern part of Phuket. I was astonished to see the many little fruit and vegetable farms cultivating papaya, bananas, tomatoes, potatoes, pineapples, that Khun Aey pointed to me along the way. Like a typical visitor to Phuket, I normally spent all my time inside resorts, on the beach, or in town, and had no idea such idyllic countryside and farms existed on the island. The most stunning part of the ride was the long, peaceful stretch of completely pristine, unspoilt Mai Khao beach. The afternoon sun sparkled on the horizon and glittered on the crystal clear waves, which burst rhythmically on the deserted beach. The sand was completely unspoilt as far as the eye could see from one end to the other, and the beach was lined with what looked like a frilly green carpet of leaves. I don’t know the name of these beach plants, but they are unusually pretty because upon closer inspection, each leaf is shaped like a heart, so if you look closely, the whole beach is covered in little green hearts – adorable! I’ve seen these plants sold in little pots Bangkok (they tend to pop up in shops around Valentine’s Day, for self-explanatory reasons) but this was the first time I had seen them en masse in nature. Khun Aey said that sometimes local people come to this beach to have a party, bring food and drinks and listen to music at night. Sounds like a lovely way to spend an evening with friends. I’m sure there are not many stretches of pure beach like this left in Phuket. I enjoyed every minute of biking along this tranquil beach trail with the perfect sea view and a cooling breeze in our faces. Cycling through the beautiful Phuket rubber plantations was so different and so much better from driving past them by car. Khun Aey was great company too. There were just the two of us since my friend T had opted to stay back in the air conditioned pool villa and work on his computer. Chatting as we pedaled along, he told me he was also a Pilates teacher and that I should try a Zumba class at the resort’s fitness center. Occasionally he would ask if I was thirsty, and out of his backpack he produced small bottles of chilled Anantara Resort water and fresh white hand towels. I was impressed with this thoughtful attention to detail. A small lotus farm in Mai Khao. This is cutely handkerchief-sized compared the vast lotus lakes you find in northeast Thailand. I was surprised when the bike route took us past the airport (not realizing we were that close to it) where we saw some airplanes sitting on the airstrip. We biked past some small hotels and then through some beautiful rubber plantations, passing jasmine farms, lotus farms, jackfruit trees along the way. My favourite sight was an emerald green field filled with a family of fat water buffaloes grazing in the sunset. I was utterly charmed at the sight. These buffaloes looked like they had a very good life, in a very good place. By the way, Thai culture looks down poorly on buffaloes and if a Thai person calls you a water buffalo, be aware that they’re actually insulting you, because these poor beasties are known to be terribly stupid. This is akin to being called a cow by a Brit, but more insulting. A Thai friend who was unaware of the social implications thought this was a compliment and was confused when I told her it’s an insult. “But cows are cute!” she insisted. She felt it was an insult to the cow, to compare it to a particular annoying person we happened to be discussing at the time. Anyway, if I am bad in this life and had to be reincarnated as a water buffalo, it wouldn’t be so bad to come back as one of these buffaloes. Oh sweet little buffalo family…is that a giant green bunny looming behind you? Look out! On the way home (home being the Anantara resort), there was a fabulous downhill glide through a shady forest, with both of us shrieking all the way down. Khun Aey challenged me to a race up a mountain but I told him he’d find himself up on top all alone while I’d be back in my nice air cool pool villa. He told me that one time some European guests had challenged him to a race and then zoomed away and left him puffing in the dust behind them. “They were 10 years older than me! I couldn’t believe it ” he said. But they were fitness fanatics and they liked to win. The bike tour took about an hour and a half (Khun Aey said he had taken me the short way but there was also a longer way) and on our return to the resort we walked into the lobby to be greeted by a lovely receptionist waiting for us with trays of iced tea and chilled lemongrass-scented towels to wipe our faces. The timing was impeccable and I was ever so grateful for those cold refreshments. (I had been wondering why Khun Aey was making phone calls (while biking with one hand) towards the end of our bike ride). 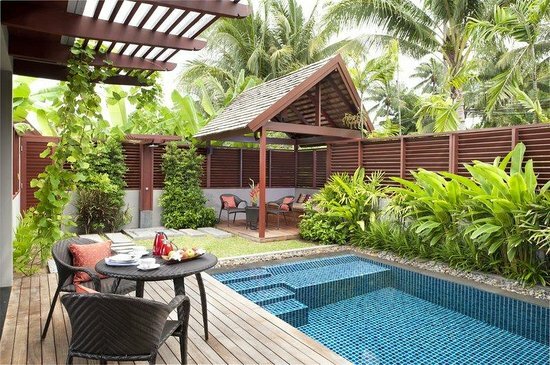 Afterwards, it was the perfect time to make use of the pool villa – I jumped straight into the private pool and stayed there until dinner time. Anantara Phuket beach pool. Your hardest decision may be whether to hang out in the pool villa or at the beach pool. 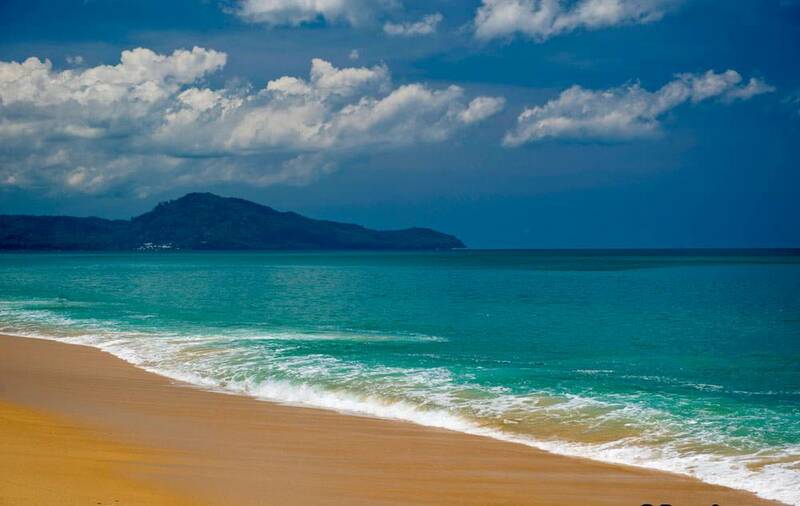 Anantara Phuket beach area. This is nice for sunset drinks. I like the bean bags. Have you been on a biking tour in Thailand? What was your favourite part?